You may have several goals you want to achieve by way of your newsletter (substitute website, blog and/or social media as it applies to you). Probably you want to increase sales. These all may well be good reasons to have a newsletter. The ones that are most important for you will depend on what type of business you have, how long you’ve been in business, what your competitive situation is, and more. 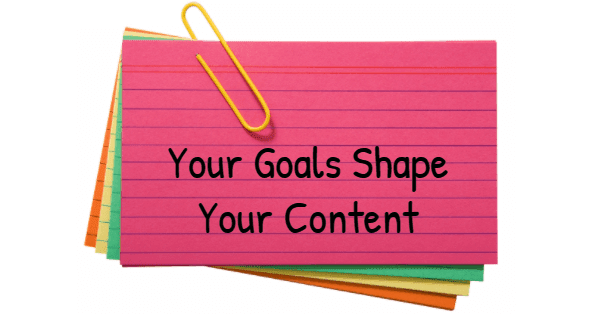 You should be able to pick 2-3 goals to specifically focus on - then match your content to those goals. (It's simple logic, but sometimes we forget.) For example, if building your reputation is a goal, then include content that builds trust. If building strong relationships is a goal, then promote others and invite them to contribute. Stay focused on content that helps achieve your specific goals and you’ll reach those goals in no time. Great motivation to set some goals going into 2012 and to stay focused to achieve them! This is good Linda. Thanks for the post. Great post Linda! The idea to refine your focus is so beneficial when creating content. Couldn't agree more...any communication in business should be 'shaped' by its purpose - not least your newsletter.